This was a fun project. 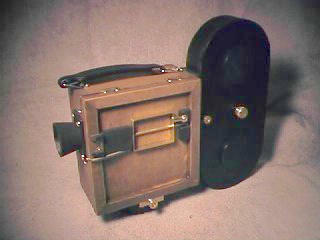 A 16mm hand-cranked Pinhole movie camera. It's made largely from bass wood and the guts of three old cameras purchased at a local used camera store. 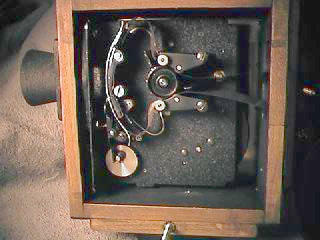 The main drive assembly is 'half' of a 1940 Kodak Model M operating at 16 frames per second. 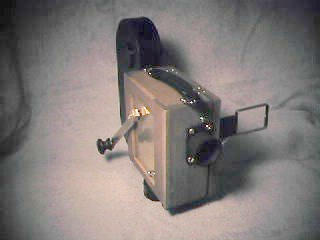 The film cassette holds standard 100 foot rolls and is made from steamed basswood painted black. Most of the hardware is brass and the body is stained (mahogony). 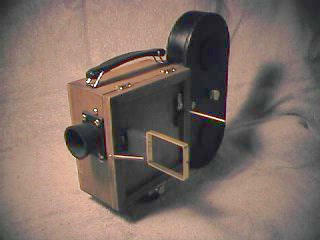 Pinhole cameras don't actually have a focal length as there is no lens used to create focus. Instead, the effective focal length is measured as the distance between the pinhole and the film plane. In this case, the focal length is 1.10 inches. Therefore the optimum diameter of the pinhole is: .0078 inches. The camera's effective aperture expressed in f-stops is the ratio of the focal lenth (1.10) to the pinhole diameter (.0078). This yields an f-stop of 141. The challenge in pinhole photography is to choose an exposure time that yields the best possible image. In pinhole cinematography, the problem is compounded by the fact that the shutter speed is also fixed. 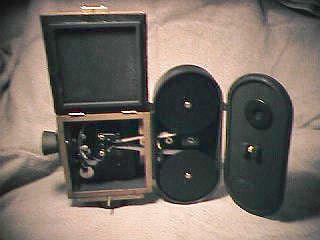 This means that the only way to obtain acceptable results is to push process the film in the lab. Standard photographic and cinemagraphic films are formulated for use between f1 and f32 and exhibit reciprocity in this range. That is, for any given exposure within this range, a doubling of aperture and halving of shutter speed will yield an equivalent exposure. But, when the aperture is outside the film's designed range....say f141, then the inversely proportional relationship between shutter speed and aperture fails. This is known as reciprocity failure. With a 180 degree shutter operating at 16 frames per second, the shutter speed of the camera is 1/32 of a second and with an aperture of f141, proper film exposure is difficult. In fact it would be impossible to calculate (extrapolate) the exposure without knowing the reciprocity properties of the film. Given the fact that both the f-stop and the shutter speed of a movie camera are fixed, the tough part is to determin the amount of push processing required to achieve the proper exposure. The next step will be to expose several rolls of test film to empirically determin the reciprocity curves for the film under a variety of lighting conditions.